Happy day everyone! Welcome to Mrs. Lincoln's Inkin'!! 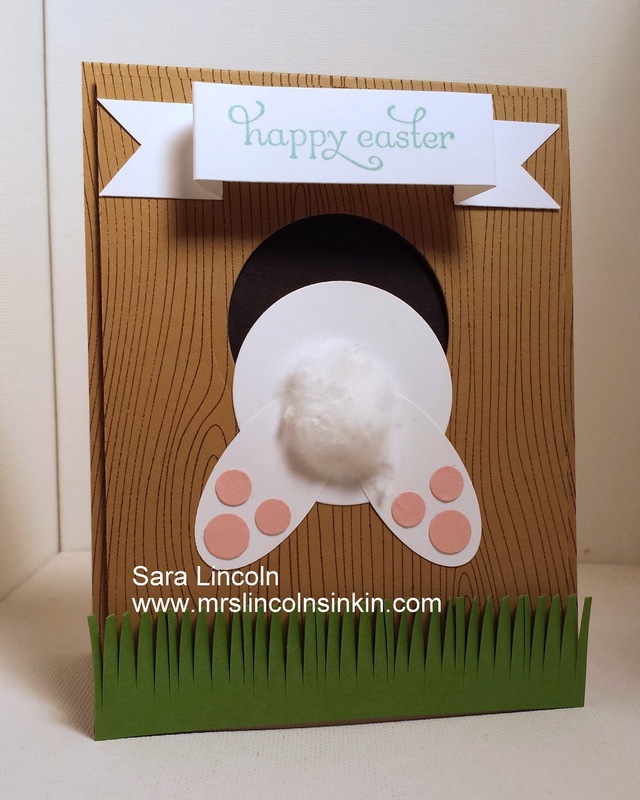 Today's share is of a fun Easter card of a bunny who is... well stuck in a tree hole! LOL, oh my.. how stinkin' cute is this card!! I did a video of this card and will have it for you for this Friday's Video! I just love this card. I have seen a few of these cards on Pinterest but wanted to do something different so i decided to make mine 3D. Just by adding another piece of the same colored card stock, 1/" smaller on all 4 sides and popping it up Dimensionals really can add a lot to your project. The bunny is made of the Circle Framelits and some punches and then his tail... a cotton ball!! LOVE IT!!!! The bottom of my card i wanted there to be grass, i didn't want the tree to just be floating there LOL so i used the new AMAZING Fringe Scissors which are in the Occasions Mini. The Fringe Scissors is also the item that i am showcasing today, they are a really great tool can be used for so many different things!